Those wacky US soldiers, always dancing! When the urge to dance strikes, sometimes you just have to bust a move. Even soldiers on patrol will bust a move, and US soldiers are no different. A video of an anonymous US soldier has surfaced, but rather than showing something bad, this video is actually something good. 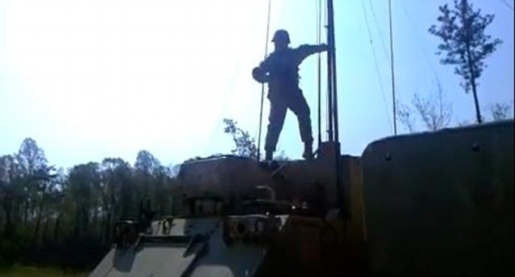 In this case, an unknown US soldier does “The Carlton Dance” atop a M1068 mobile command center. I know what you’re thinking; let’s just cut the chatter and get straight to the video. The best part? Well, besides the rockets flying in the background, it’s the fact that the video is perfectly synced up to Tom Jones’ hit, “It’s Not Unusual.” The fact that he’s brave enough to do this in public, let alone on top of a vehicle where everyone can see him, is just icing on the cake. Being shot at is one thing, but public humiliation via Carlton Dance? That’s an incredible undertaking, and a (literally) moving example of why the United States is the best country on Earth.